BOLLING AIR FORCE BASE, Washington, D.C. (March 22, 2007) -- The Air Force District of Washington hosted a blood drive at the Edward H. White Community Center here Tuesday to provide blood and blood products to the Armed Services Blood Bank Center. Most of the blood from the collection, like other blood collected by the Center, is headed overseas to support troops injured fighting the global war on terror as part of operations Iraqi Freedom and Enduring Freedom. Having an ample supply of blood is critical to keeping injured troops alive, said Maj. Gen. Robert L. Smolen, commander of the Air Force District of Washington. Maj. Gen. Robert L. Smolen, commander of the Air Force District of Washington, donates a unit of blood during Tuesday's blood drive at the Edward H. White Community Center here. The blood will be used to help the Soldiers, Airmen, Marines, and Sailors injured fighting in the global war on terror. "The medical people there tell us this blood is critical to save lives," he said. "They go through a lot of blood during surgeries, for instance, so this really is a life saving product." 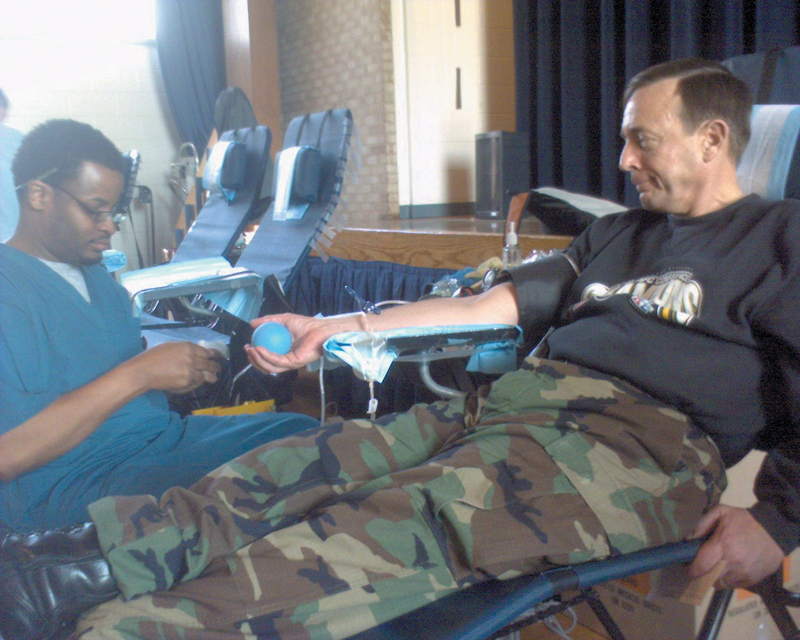 The Armed Services Blood Bank is a joint service operation based at Bethesda Naval Medical Center in Maryland. The Center is responsible for collecting blood in and around the National Capitol Region and then distributing that blood first to support the global war on terror, and second to area military hospitals like Walter Reed Army Medical Center in Washington, D.C., Malcolm Grow Medical Center at Andrews Air Force Base and Bethesda Naval Medical Center in Maryland. A unit of blood from a single donor, about 450ml, can mean the difference between life and death for a Soldier, Airman, Marine or Sailor who has been injured overseas, said Navy Lt. Cmdr. Corey Jenkins, who ran the blood drive. Military members stateside should take every opportunity available to them to donate blood, whether they support the war or not. "If you want to support our mission overseas, donating blood is a good way to start," he said. "A lot of military members are able to come home from overseas because somebody here donated blood. Whether you are opposed to the war or not, it is Americans over there fighting, and this is one way to support them." Commander Jenkins also said a single unit of blood can actually save as many as two lives, because once it has been tested for diseases like HIV and hepatitis, it can be split into both red blood cells and plasma -- two products the center would like to make more of. The center collects about 600 units of blood a month, but it wants to collect about 800. "We really do need more people to come out and donate blood when we have these drives," he said.